-A huge game is any game of Pirates that totals at least 1,000 points at any given time. -A campaign game is any game of Pirates CSG that uses gold to purchase additional game pieces during the game, rather than the game ending under the normal rules. -There isn’t really a difference between a “campaign game” and a “cumulative game”. I would suggest that the main difference is that a campaign game (CG for short) often uses a custom ruleset to make it a campaign, while a cumulative game is generally a “regular” CG without any custom ruleset used aside from a few house rules. If you’re interested in playing your own campaign games, I’d recommend the Guide to huge games thread. This thread heavily borrows from that, but is more of a reflection and analysis with less how-to and more spoilers. I have documented the epic history of my huge games, with links to the games played by Xerecs (and his brothers and friend) as well. (he may create entries for his games at some point) Enjoy! 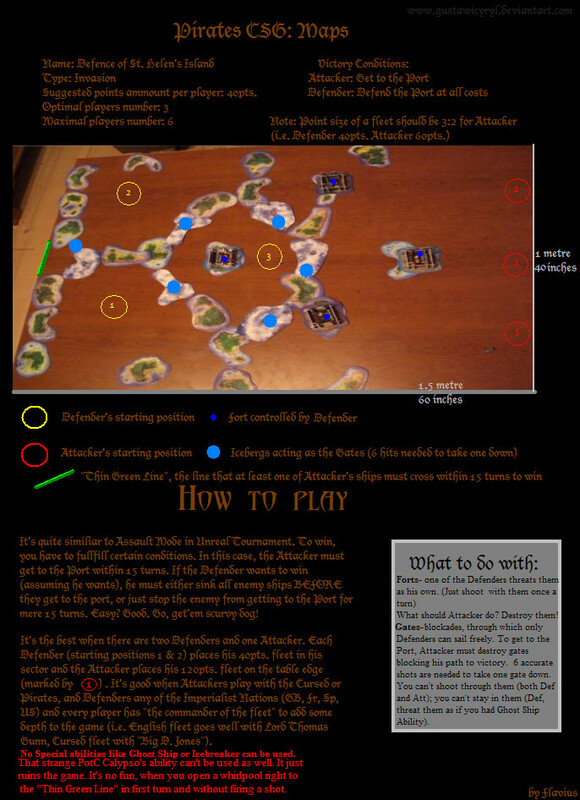 Click on a game’s title to read the battle report. Summary: My first cumulative game, at least as far as I can tell. This may be my favourite battle report I’ve ever written, even though I wrote most of the report years after the game took place. This is my most nostalgic game of Pirates. It’s the only actual game to feature the harbour system, which was mostly used during Historical Fantasy Scenarios. Starting conditions: 20 points per fleet, 20 wild islands (14 mysterious), many UT’s. -Pirates vs. Spanish (and later vs. English): Largest battle of the game. Spanish eliminated from the game. Very heavy losses for the Pirates. Pirate victory. -French vs. Americans: Unknown victor, French likely failed in their efforts to steal the Cursed Conch. -English vs. French (and later vs. Pirates): English and French nearly eliminated each other, making it relatively easy for the Pirates to deal with the leftovers and win the game. Pirate victory. Possibly English vs. French, though this wasn’t important compared to the above rivalry. None known other than the permanent alliance to beef up the smaller factions. -I didn’t record the order of eliminations for all the factions, so I’ve left this blank for my spreadsheet. Pros: Epic battles, massive fun with the Cursed Conch and it’s effect on the game, and using the harbour system in a real game. Cons: Far too much distance between islands and harbours, not to mention the locations of the harbours themselves on the ocean. I used an entire room for this game, and as a result the English and French harbours were considerably more isolated than the Spanish, Pirate, and American harbours near the middle of the sea. Overall size: Unknown. I never did a point count, but according to my original reports, there were over 100 ships in play at some point. Estimated size between 1,200 and 2,000 total points, the peak size likely occurring right before the outbreak of the big battle between the Pirates and Spanish. I used almost my entire room for the ocean, so it was a very long rectangle with another rectangle for part of it (shaped somewhat like “00oo”, if you pretend that the shape is floor/ocean space). After measuring the same area, the total length was about 15 feet. The narrow end of the rectangle had the English and Spanish harbors (3.5 feet wide), while the bigger end with the Pirate, American, and French harbors was 6.5 feet wide. When combining these two areas (8.5×3.5 and 6.5×6.5), it gives a total ocean size of 72 square feet! -Likely one of the biggest and most chaotic battles of all time with the Pirates vs. Spanish vs. English changing the game for the remainder, eliminating the then-favorite (Spanish), and just causing a huge mess. If the Pirates had suffered smaller losses, they might not have actually won, as the losses forced them to return to their harbor while the other factions fought and weakened each other, allowing the Pirates to return at decent strength. All I remember is that all hell broke loose. The Spanish panicked, the chain broke, and the Pirates attacked! Summary: Still the largest “regular” game I’ve played, this was the first of three 5 player 500 point games. The first one was definitely the best of the three, and it remains one of the absolute best games I’ve ever played. It featured a lot of memorable moments, and the finish was downright epic, including the top 3 fleets being within 5 gold of each other! Starting conditions: 500 points per fleet, 20 wild islands, 21 pieces of terrain, many UT’s. -English vs. Pirates: Indecisive and short; various capital ships on both sides sunk. -French vs. Amercs: Indecisive, minor losses on both sides. -Pirates vs. Spanish: Small stakes; Spanish victory. -Spanish and French (not allied) vs. Amercs: Amercs would have eventually been eliminated if not for the game ending due to all gold being unloaded. -English vs. Pirates: Indecisive chase battle. English suffered heavier losses but battle was irrelevant to end results. Anglo-Spanish vs. Amercs: Likely without a declaration of war, but the closest this game came to having a true war. The allies had the upper hand in combat and would have eliminated the Amercs in the long run, but the Amercs got the last laugh by “unintentionally intentionally” giving the Pirates (a rival of both the English and the Spanish) the win via Davy Jones. Pros: Start out with long turns, and then the game gets faster as you go along (the opposite of cumulative games). Very fun and fast-paced gameplay, with a lot of big decisions affecting the outcome. Overall size: 2,520 points at the start of the game. This includes the four 0LR +5 crew. Essentially a 2,500 point game. 157 total ships. -Tied with the other two 2500 point games for the largest total build points used in a “regular” game. …the English/Spanish are planning to go on the attack as soon as they can repair their damaged gunships and formulate a plan of action (or a plan of extra actions, haha). Summary: Similar to the first one, just not as exciting and memorable. 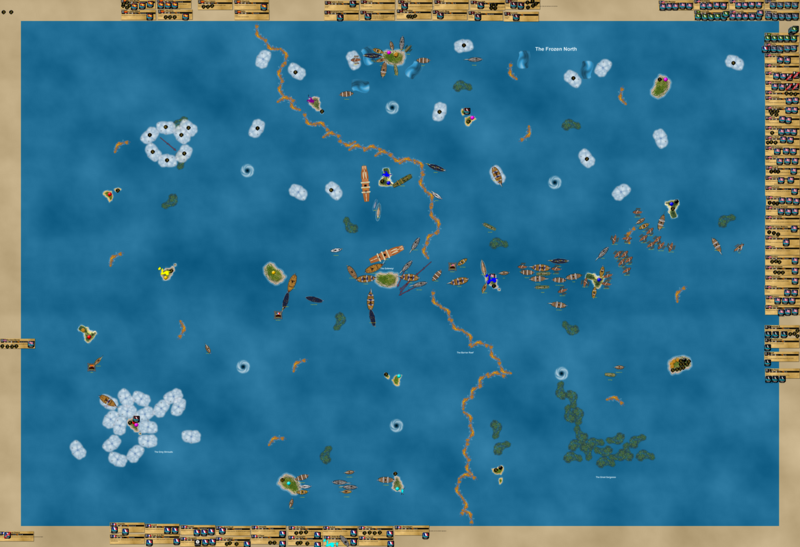 Starting conditions: 500 points per fleet, 15 wild islands, 14 pieces of terrain, 16 UT’s. Not any true wars in this game, it was a somewhat chaotic free-for-all and there wasn’t as much bad blood and defined rivalries as in most huge games. 5. Merccursed: 0 (I put them behind the Spanish because they never had a single coin at any point during the game). Pros: Same as the other 5 fleet 500 point game. Cons: Not as exciting as the first 2,500 point game. For me, the least memorable huge game I’ve played. Overall size: 2,520 total points. 165 total ships. The English used the “round earth” rules to go to the other side of the sea and try to get to two far-off islands, but things became much more complicated than that. The English ended up having to send some of their best gunships over to take care of the Pirates, heading for the same islands, and took out 24 masts in one turn of furious broadsides (mostly the work of the HMS Grand Temple, HMS Titan, Bretwalda, Ark Royal, and Apollo). Summary: This remains my only personal custom ruleset. Combining the land warfare of RISK with the naval warfare of Pirates, this game was epic indeed. Coming up with the rules and designing a global ocean took a lot of time, but I was eventually satisfied with the setup. This was also my first time playing a huge game that utilized a custom ruleset. 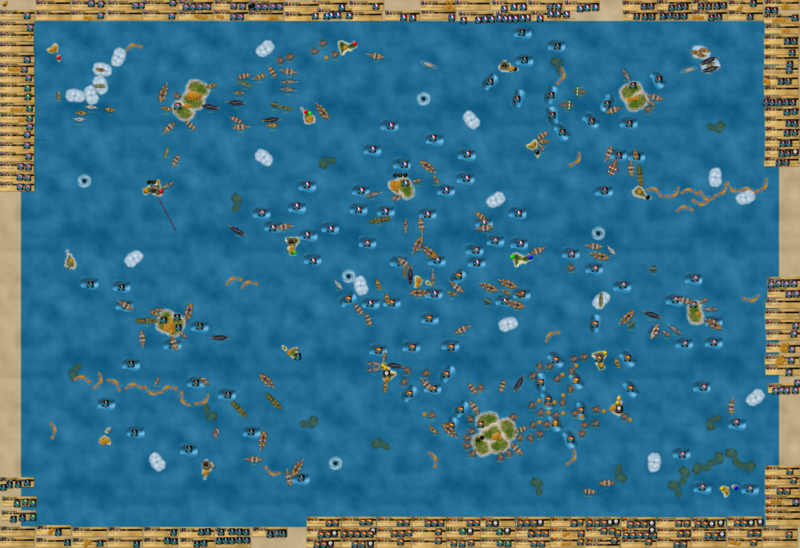 -Two maps: the regular RISK board used for land combat, with another area for the world ocean where the ships were. None declared that I know of, though the English vs. Spanish and MCCR vs. English (at the end) rivalries could certainly be considered full-scale wars. Pros: Truly realistic “global” scale, using real-life territories, continents, and locations. Very interesting take on the world of Pirates CSG to combine it with another game. Grand scale that makes you feel like you’re playing a game of life rather than just a petty war in the Caribbean. Cons: The RISK portion was underpowered. If I play this game again I’m going to edit the ruleset so troops can acquire gold over land. Overall size: Unknown. Definitely a huge game, but probably under 2,000 total points. The only clue is that at the beginning of the final battle, the two combatants combined for 62 total ships, with the other fleets having already been eliminated. Total length: About a week I think. -None that I know of, other than one of the only games (or the only one) to use two maps that represent the same ocean in the same game. -10 master futility: Shui Xian and Baochuan (the latter with a world hater ability) go 2 for 13 combined during a turn. English won the final battle somewhat easily despite having no 10 masters against 3 for the MCCR’s. The Spanish wanted to control all of North America, as well, and the English HT of Greenland was the only territory left that they hadn’t occupied. They had built the fort Puerto Blanco on Hawaii, and were transporting troops from there to Alaska when the English rounded Alaska and began their assault. The Spanish panicked and asked if the English would stop their attack if the Spanish retreated from Hawaii and stopped the apparent invasion preparations. The English went on with their attack, with nothing to gain from letting the Spanish get away. …the Spanish decided on a desperate cheap shot, using the Santos Romanos to sink both the Victoria and her prize. Furious, the English turned around the untouched HMS Apollo (F&S version) and blew the Spanish blockade runner out of the water at point-blank range. With that, the Spanish lost their last ship and are officially out of the naval war. Shap’ng Tsai, captain of the obtrusive Shui Xian, seems a bit confused on how to help out, as he thought he would be fighting, not watching and carrying troops. Summary: The biggest deathmatch I’ve ever played. A fun scenario, but the fleets were probably too big for it (maybe the only time you’ll hear me say that!). It was more memorable than the second 2,500 point game but slightly disappointing overall. However, the scenario itself is brilliant and rather interesting. Starting conditions: 500 points per fleet, 1,500 total points for the attackers and 1,000 total points for the defenders. The picture shows the rest. Just the 3 on 2 nature of the scenario. Incredibly massive logistical maneuvering nightmare! The attackers won on turn 14, one turn before the time limit would have expired and given the defenders the win. Pros: HUGE deathmatch! Lots of chaotic fighting, especially around the forts and entrance points. Cons: Fleets were a bit too big – lots and lots of rolling dice. Overall size: 2,520 points. 137 total ships. I would play more today, but the ten masters have ruined my gaming experience for the day . I would rather not go on a long rant, but if they keep disappointing me I think I will flip out. Basically, they all stink. Summary: A monumental achievement for me on so many levels. The MT era of battle reports was born, as well as the advent of pictures. This was the first cumulative game ruleset created by someone other than me that I played. This game and its reports redefined my standards for battle reports, and I’d like to think they’ve only gotten better and clearer since then. The game itself was absolutely fantastic; CotE is one of the best rulesets created for this game. Starting conditions: 20 points per fleet, 6 home islands, 12 wild islands, along with a Frozen North and Sargasso South. Pros: Epic ruleset, huge ocean, big fleets. There are certain things in the ruleset that mimic real life, colonization, and empire in ways that RISK cannot. I love upgrades and the slow but natural pace of the game. Definitely a ruleset worth playing over and over again. Cons: Inevitable rich-get-richer/poor-get-poorer nature of a cumulative game. Also takes forever, which I didn’t realize. 3 weeks was a decent start, but not long enough. Overall size: 1,212 points in the sea at the end of turn 41, when gold production stopped. This sounds low based on the scope and nature of the game; it felt bigger than 1,200. The game ended up taking 62 total turns. The ocean was somewhat of a giant square, as you can see in the pictures, somewhere around 6 feet by 6 feet. The upside down SM island is actually a Cursed trade current that was placed by the UT Lost that was dumped on the Viper’s Bite via Pandora’s Box. Summary: After two years of smaller games, it was finally time to take on my most ambitious project yet. The ruleset was key, and it proved to be possibly my favourite ruleset yet, mostly because it limits the rich-get-richer/poor-get-poorer aspect that usually dominates cumulative games. In the back of my mind, I kept thinking to myself that I wanted to make this game bigger than anything I had ever done. I accomplished that goal, but at what cost? Pros: Biggest physical game ever. Best-looking game I’ve ever played. Unique, custom made islands, terrain, and locations used for the first time ever. 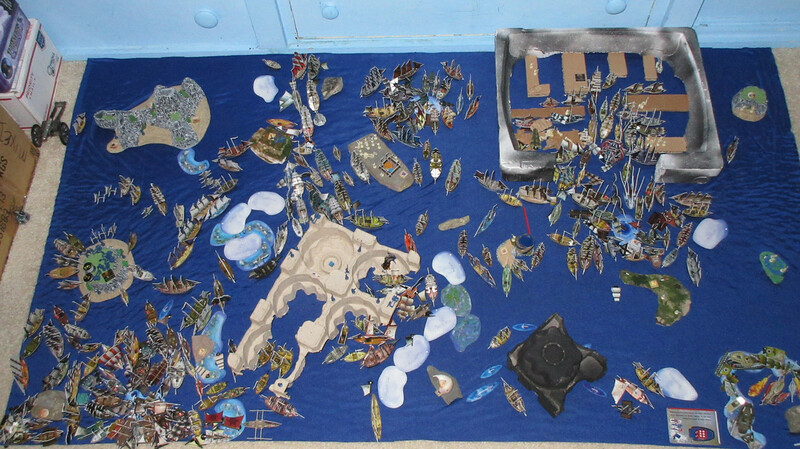 New concepts including the lagoon, arch, and gold-laden shipwreck. A blue ocean was used for the first time. MASSIVE fleets, huge launchings, epic strategy plays, incredibly diverse fleets, extremely unique ruleset that made the game more fair, shiny gold, shiny silver, chain exploring with native canoes, tons of fun, very intense battles, crazy house rules. Also introduced stuff from my custom set, CC Mike’s set, and RtSS. Nuff said? Cons: The biggest disaster in my history of Pirates CSG. A horrific accident destroyed the entire setup and many ships were destroyed beyond repair. The bigger the stakes, the bigger the potential fall. Overall size: 2,846 points at the end of turn 33. At the time, this was the biggest game I’ve ever played. Turn 33 alone saw over 1,000 points’ worth of purchases, meaning that one turn saw more stuff introduced than entire games start off with! Those 2,846 points accounted for 163 total ships, showing how heavily crewed a lot of them were. 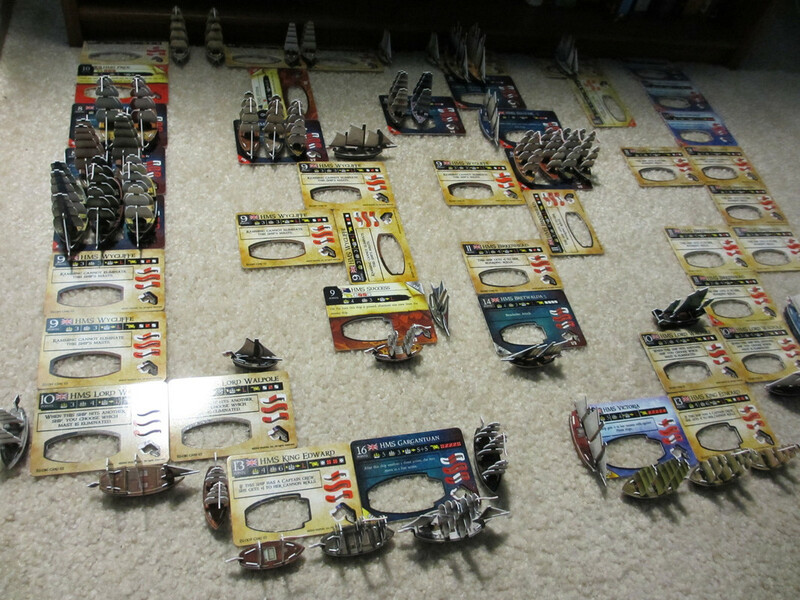 A number of turns later, another ship count revealed 181 ships in play, making this one of the biggest games ever by ship count as well as point count. In addition, with a higher number of ships the second time around, it’s likely that the game exceeded 3,000 total points. The ocean was about 5 feet long by 3 feet wide. Papa Doc cancelled Champ to the surface, allowing Brachyura to rip the serpent’s head off! The point count exceeded even my expectations, showing the absolutely epic and grand nature of this ridiculous cumulative game! After 38 turns, the carnage and chaos continues to mount. However, the Black Mamba rolled 0/3 and even rolled a 1 to eliminate one of her own masts for one of the least effective shoot actions in recent history, losing masts and not damaging the enemy in the process! …the Black Mamba went 0/3 once again and rolled two more 1’s. This means she’s 0/6 and has lost all of her masts based on her ability, not from any hostile ships shooting at her! An incredibly bizarre sight, the lagoon’s island has been temporarily displaced with gold still on it. Summary: After reviving the VASSAL module, Xerecs and I became excited by the possibilities of campaign games on the module. We hastily planned the first one, which would be a “regular” cumulative game with no special campaign ruleset or many house rules. 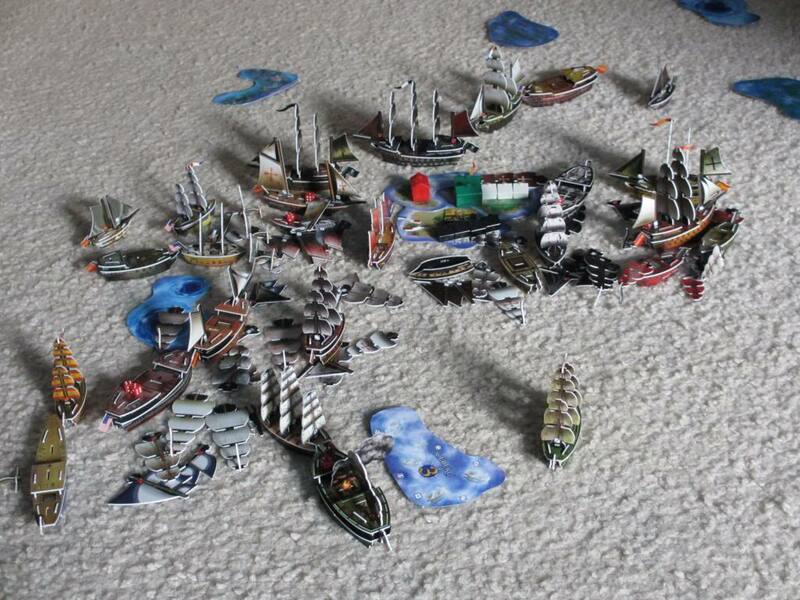 Each of us controlled 3 fleets, which we HAD to play independently. -Overarching fleet strategies: the Spanish were my imperial faction from the start, while the Cursed were a trouble-maker and the English would play “nice” (compared to past CG’s) and save gold. Xerecs had his own strategies for his fleets, but they were mostly wrecked somewhat early in the game by the Cursed and Spanish. Pros: First campaign game played remotely (as far as we know). The first of many campaign games between Xerecs and a7xfanben! Plenty of custom game pieces were used. In addition, the interaction between leaders through the VASSAL chat was very unique (much of it wasn’t recorded, but the game was more complex than the battle reports show). It also became the largest game of all time (since broken by Command the Oceans). Cons: Typical negatives of a standard CG. The rich got richer, and the poor got poorer, almost without exception throughout the entire game. As the game swelled to enormous size, the map started to look a bit too small, but the chaotic and bloody War for CG1 brought the game to a relatively quick end. This was about as “normal” as campaign games get, but it was a fantastic test of VASSAL’s capability (as well as Xerecs and I’s capability!) to run a long campaign game. One of the biggest problems concerned the lag – when the game size reached ~2,000+ points, zooming out to see more of the ocean produced a lag in the module. This was countered by simply ignoring the lag, and sometimes by not zooming out at all. Summary: For the second VASSAL campaign game, which started just a few days after the first one began, Xerecs and I wanted more than just 2 players. The game would be played at a slower pace than CG1, and we managed to bring El_Cazador and ownage98 into the fold. This brought us to a whopping 4 players, a large number of people to play a campaign game with, let alone remotely using VASSAL. Each player would control 1 faction-pure fleet, and just like CG1 there was no special ruleset. Pros: This gave El_Cazador his first campaign game experience, and allowed Xerecs and I to have a distraction from the intensity of CG1. It was also a great chance to try out some custom game pieces, which we did. As the game took longer than CG1, an edit to the module was completed during the game, which allowed the first usage of 10 masters on VASSAL, during a campaign game no less. Cons: A huge disappointment. After committing to the game, ownage98 realized he was in way over his head, leaving the game after just a few turns. This took the Americans out of the game and left a void in the western area of the sea. It also left us with 3 players, which was only 1 more than CG1. Other problems began to develop. The ocean was a bit “tall”, and I should have made it as wide as the ocean for CG1. El_Cazador’s frequent absences and hiatuses were a much bigger problem, as he was too busy and/or disinterested to pursue remotely consistent play. As you can see from the battle reports, the game went for long stretches with no turns being played, and even when turns were played, they often ceased soon afterwards for another hiatus. There was no combat until late June, after starting the game in February. You’d think that would spark more playing, but again the game suffered a huge delay, with the next turn happening in late September. El_Cazador tried to sail his fleet off the map before Xerecs and I convinced him to keep playing. The game became lopsided towards the end, and an interference by the dominant faction unintentionally caused the game to stop and end prematurely after a chain reaction which would have led to a predictable finish even had we kept playing. -One of longest campaign game I’ve played by how long it took (10 months), but certainly not remotely close by how many turns were played or total time in hours spent playing the game. The English were not going to fail in their objective again! The first raid was 2 10 masters and 3 subs, but this raid has 3 10 masters and 5 subs, with the Leicester backing them up to boot! The English are gunning for Emperor Blackheart, and for good reason. While the English have built up their battle fleet with sheer firepower and a possible numbers advantage, EBH threatens to throw everything off course with a single lucky die roll. Lord Thomas Gunn doesn’t see that as fair, and thus has ordered EBH’s execution. Now that the PC and Corcoran have been taken out of action, the English get closer and closer to being able to run unrestricted submarine warfare against the Pirates if they need to. At this point negotiations broke down. In a single turn the 3 English-controlled 10 masters in the deep south fired off around 50 shots to absolutely devastate the Pirate resistance. The MF will be a busy ship helping out with crew logistics. … This situation is one of my favorite things about campaign games – strategies that aren’t viable in regular games become fun side diversions in CG’s, and the flexibility and grand strategy involved just make it a much more rewarding experience. At this point the English decided to intervene! Summary: I wanted to play a campaign game to show off some of my custom stuff I created for the third Ocean Terrain Contest. Funny enough, as I played more and more, it became FAR more about the game itself than simply revealing the new islands and terrain in grand style! With more ocean space than I had for Economy Edition, and determined to top myself after that game and CG1, soon after play began I realized that I would be trying to play my most epic and biggest game EVER! -“Real” foam icebergs, and breaking them up too! -Second Battle of Fog and Ice: Inconclusive, heavy losses on both sides. Jades suffer slightly worse losses but Cursed are the first to retreat. I got to show off many of my cool island/terrain pieces. However, the game became much more than just that, since now this game is more about its own legacy than OTC3. I experimented with various house rules. I got into some video content for the first time for a physical game. I did a lot of awesome narrative stuff to make the game exciting and fun to read about, including some big surprises and twists. I had a lot of fun with the strategic and tactical side of things, especially with a whopping EIGHT factions participating. For some factions, I got to use almost my entire collection since the game got so big. I have over 3,500 awesome pictures to use for years to come. The battle reports have inspired multiple people with their own CG efforts, and tons of people have enjoyed reading about the game. Almost the same things about EE could be said here, as it became the greatest campaign game ever by most aspects you could consider. The most frustrating, trying, and difficult game I’ve ever played. The physical hardship of EE was multiplied by 3, both for the length of the game (1 month vs. 3) and the points involved. A full round of turns in a 9,000 point game can take 8 hours, so things progress at a glacial pace regardless of how often you play. There was a lot of bumping things, knocking stuff over, moving between rooms to check a crew setup for a gunship, etc etc. Overall it’s an experience I would not want to repeat again. The lessons hold though – have an unlimited amount of time to play the game, and try to play entirely on tables. You need serious real estate and literally unlimited time to get these things right. The Pirates pull off a huge masterstroke of grand strategy, weakening two huge rival fleets with one deal while simultaneously able to focus on their other rival. Summary: After having 3 different players combined between CG1 and CG2, CG3 set a big new record at 6 players, with 4 of them being new to campaign games. It was decided that the Economy Edition ruleset would be used, and the ocean would be the same size as CG1. Pros: Having a lot of players was fun, and gave them some valuable experience with a large game. The EE rules are good, and some players utilized game pieces from RtSS along with some customs. Cons: The game eventually became lopsided and one faction was able to run away with the game. Unfortunately there was a domino effect that resulted in 3 of the 6 players hardly getting to play, so their first CG experience was quite limited. So all in all, you could say “the Americans hit the nuclear option”. XD Declaring war on the second-largest faction, launching a new 10 master, potentially wrecking their only alliance, and going ballistic on the game in an attempt to dominate this ocean. All of this (except the attack on the Pirates) has been in the works for weeks, but only now was it the perfect time to strike. It has now been about 5 hours since I downloaded the new file and started my turn, which took over 3 hours. Thanks for reading, and thank you to those who are playing this huge game! With that, we can analyze the results and come up with some all-time standings and leaderboards. Since it was very short and a team game with permanent alliances (not to mention a deathmatch), I have not included my Defence of St. Helens game in the results. It’s interesting that the Pirates and English won the first 6 huge games I played. It wasn’t until I got on VASSAL that a different faction would win, but then the English won yet again in CG2. The English have won about half of the huge games I’ve played. Until CTO, the French were winless, and they had not even finished higher than 3rd in any of the games. The Americans have only played by themselves in 6 of the 9. The Spanish were either 2nd or 4th in all the games before breaking through for a big win in CG1. Before CTO, the French finished last in 3 out of 4 games played since 2013, and second-to-last in the other one. As you can see, the English and the Pirates are generally the best factions for huge games. The English do hold a decided advantage in the combat department (last fleet afloat), which really helps in the huge battles and long endgames not seen in smaller games. The English do a little better than you would expect them to based on popular opinion and smaller games, while the French do a little worse than expected. With a very impressive 3 wins in 2 years, the French have caught the Pirates for second-most all time victories. They have been very up-and-down, literally with first or last place finishes in 5 of the past 6 CG’s! (and second to last in the other) However, they have certainly redeemed themselves and more after a terrible run from 2011-2015. The Spanish are consistently quite good, but only have one victory to show for it. Especially since 2015, the Americans seem to do quite well or quite bad. The Cursed have yet to win, but have finished twice when you count the RISK game where they commanded the alliance. The 7.5 for “Other” in CTO refers to the Jade Rebellion finishing in 7th and the Mercenaries in 8th. The Pirates haven’t won a huge game since 2015’s Economy Edition, which I see as kind of a “turning point” or landmark game since it inspired Xerecs and spurred a “new era” of CG’s that has resulted in a whopping 9 campaign games since June 2015 (not counting the unfinished 2017 Campaign by Xerecs). After a long drought (for them) of 5 straight campaign games where they didn’t win, the English have surged back to win 2 of the last 3 concluded games and second in the other. Quite impressive for a faction that some would consider (understandably so) to be the 4th-best faction behind the Pirates, Spanish, and French. For now, the English claim the title of best all-time faction in huge games, with the Spanish and Pirates a ways back but close to each other (which shows the Spanish consistency). The French, Americans, and Cursed are together in the next group, surprisingly close together in fact. The “Other” factions are likely to never win, but they made some big waves in the RISK game and the JR’s in CTO. True winner of each category listed first when possible; others are similar to honorable mentions, or dishonorable mentions in some cases haha. These are also for games I’ve been involved in, though I have a few shoutouts to Xerecs’ games when I remember enough. However, this has been made mostly a thing of the past now that France and America have 4 victories on their own between them. Honorable mention to the English and French perhaps: the English kinda stank for a while but have recently surged back to nearly win 3 in a row. The French underperformed for a while but have the most victories since 2016 and are habitually underrated by Xerecs and other players. -Likely even more controversial is Xerecs’ winter Economy game, which is still a murky and strange subject. Longest drought: French were technically 0 for 9 in my games before finally breaking through for the win in CTO. The longest current drought goes to the Pirates, who have not won a huge game since 2015’s Economy Edition. (though the Cursed and “Other” have never won). Most satisfying story? Spanish coming very close to winning both 1st 2500 pointer (Cursed interference at the very end) and CotE (somewhat close final battle, closer if the Acorazado hadn’t been eliminated by a UT combo). Then brutally destroying everybody in CG1 for the most dominant and deserved victory of all time. I mostly made this for my own enjoyment and something cool to look back on. I will do my best to update with future huge games. I think aesthetics might be the main reason the BR’s for CG1 (and CG2 and CG3 to a lesser extent) aren’t as appreciated or read as much as those from EE/CoEC/CTO, etc. I personally care little about how VASSAL doesn’t look nearly as good as a physical campaign game (especially one with custom islands/terrain and a blue ocean), but I think that’s because I enjoy the sheer play SO much and I’ve been heavily involved in the VASSAL CG’s of course. The experience made it great, but it’s hard to convey that to someone who can’t relate as much. CG1 was just GREAT. All-time great, for gameplay, strategy, story, etc. Maybe I overrate it a bit, and I certainly look forward to topping it, but now that CTO has had a few months to sink in, I’d say I still like CG1 more as far as the game itself went. Although that’s partly due to the toll that CTO took on me and how the rushed ending compromised the rules. It also has been the VASSAL CG with the most parity, though you wouldn’t know it just by looking at the results. Long live CG1, but it won’t be on the “throne” forever…. Do the links to my posts on MT still wok, what with me being banned and all? Yes indeed! I’m glad I had the links saved from the original thread because it’s just about the only way to access them now. When someone’s MT account closes for any reason, their content becomes unsearchable in the forum – threads started by that member don’t show up, and the search function doesn’t reveal any of their past posts. But direct links still work fine, which is great. Even better, most of the pictures still show up, though some of the older ones have a new photobucket watermark on them. You have all of those CG BR’s saved somewhere right? Revisiting after Podcast #40. I have word docs for my non-Video BR’s on my laptop hard-drive, along with the image files themselves. I’ll be converting those over to video reports in due time. CG1 was all right. I kinda got wasted but the Pirates and French went down in a blaze of glory. 😀 Also, I tried to use some of the strategies and tactics the Spanish did when I had them for the CoEC 2018 game. @Xerecs: Nice, great to hear that. I don’t say CG1 was one of the absolute best games just because my fleets dominated – I think it was truly one of the most exciting, interesting, big, and epic games ever. Almost every other CG seems to have at least one major flaw. Especially considering that we finished the game in a very quick 3 months (relative to the points involved and length of CG2 and now CG4), it was just a beautiful grand experience. From the gameplay to the battle reports to the overall stories of the game, I think it deserves a very high place in the huge game rankings.